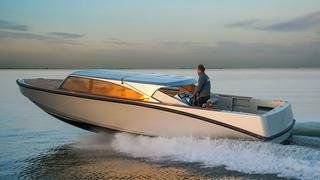 Is this the world's fastest superyacht tender? Speed is serious business among yacht makers, with several yards vying to create the world's fastest superyachts, and it's only fitting that your tender should be able to keep up with the mothership. 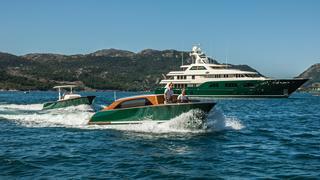 Blowing the competition out of the water is the latest model from Greek boatbuilder Technohull. 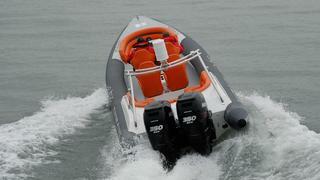 The Sea DNA 999 is a 10.3 metre RIB tender with a claimed top speed of 81 knots, as proven by her recent sea trials. This means owners can cruise from Athens to Mykonos in less than two hours — ideal for a speedy weekend getaway. This staggering performance is possible thanks to a deep V hull slicing through the water and either twin 400hp outboard engines on the back or a sleeker 530hp inboard set-up (pictured above), which is still good for 63 knots flat out. The Sea DNA 999 is offered in three bow configurations: cabin, open and delta — the latter of which is ideal for relaxation, with sunpads covering the entire area forward of the helm position. Speed is serious business among yacht makers, with several yards vying to create the world's fastest superyachts, and it's only fitting that your tender should be able to keep up with the mothership. Blowing the competition out of the water is the latest model from Greek boatbuilder Technohull. 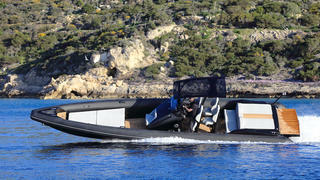 The Sea DNA 999 is a 10.3 metre RIB tender with a claimed top speed of 81 knots, as proven by her recent sea trials. This means owners can cruise from Athens to Mykonos in less than two hours — ideal for a speedy weekend getaway. This staggering performance is possible thanks to a deep V hull slicing through the water and either twin 400hp outboard engines on the back or a sleeker 530hp inboard set-up (pictured above), which is still good for 63 knots flat out. The Sea DNA 999 is offered in three bow configurations: cabin, open and delta — the latter of which is ideal for relaxation, with sunpads covering the entire area forward of the helm position. Launched at the 2017 Miami Boat Show and billed as "the world's fastest luxury yacht", the 11.7 metre SV Alpha has a claimed top speed in excess of 78 knots. This speed machine gets its power from a pair of 700hp Mercury Racing SCI engines paired to SSM6 surface drives, although a more sensible twin 520hp version is also offered. Premium features include bespoke sunpads, a champagne cooler, underwater lighting and a high-end stereo system. Ideal for daytime entertaining, the SV Alpha can carry up to 15 guests on the ride of a lifetime. Launched at the 2017 Miami Boat Show and billed as "the world's fastest luxury yacht", the 11.7 metre SV Alpha has a claimed top speed in excess of 78 knots. This speed machine gets its power from a pair of 700hp Mercury Racing SCI engines paired to SSM6 surface drives, although a more sensible twin 520hp version is also offered. Premium features include bespoke sunpads, a champagne cooler, underwater lighting and a high-end stereo system. Ideal for daytime entertaining, the SV Alpha can carry up to 15 guests on the ride of a lifetime. For a long time, sticking three outboard engines on the back of a centre console boat was a big move in the horsepower game, then came the five-engine Midnight Express Quintessence43. Powered by a quintet of 400hp Mercury outboard racing engines, the Quintessence43 flies by at a whopping 78 knots (90 mph). Thanks to a twin-stepped hull design, she gets up onto the plane quickly for added comfort and a smooth ride at such high speeds, as shown in this video of the new Midnight Express Quintessence43, making her a great fast superyacht tender choice. For a long time, sticking three outboard engines on the back of a centre console boat was a big move in the horsepower game, then came the five-engine Midnight Express Quintessence43. Powered by a quintet of 400hp Mercury outboard racing engines, the Quintessence43 flies by at a whopping 78 knots (90 mph). Thanks to a twin-stepped hull design, she gets up onto the plane quickly for added comfort and a smooth ride at such high speeds, as shown in this video of the new Midnight Express Quintessence43, making her a great fast superyacht tender choice. Anyone who catches a glimpse of the four bright orange bucket seats on the RX700 will think the same thing — speed. And they are not wrong, the 9.6 metre RX700 tender from Wahoo Ribs is not for the faint-hearted. The outstanding performance characteristics of the Wahoo hull combine with the twin 350 horsepower, super-charged Mercury Verado outboard engines, to fire it to a staggering 70 knots (80.5 mph). However, the meticulous design means the RX700 isn't just about speed. 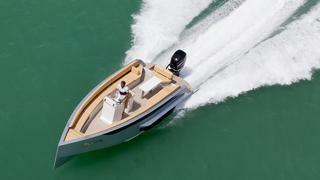 According to Wahoo it is also "perfectly behaved at sea in a sedate superyacht tender environment". The large 700 litre fuel tank means the RX700 is not just a one-trip wonder either. With a range of over 300 nautical miles it can easily venture ahead to the next destination along the coast, without having to wait for the mothership. Anyone who catches a glimpse of the four bright orange bucket seats on the RX700 will think the same thing — speed. 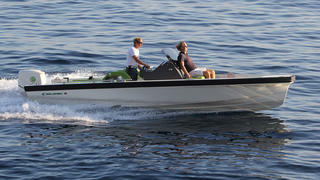 And they are not wrong, the 9.6 metre RX700 tender from Wahoo Ribs is not for the faint-hearted. The outstanding performance characteristics of the Wahoo hull combine with the twin 350 horsepower, super-charged Mercury Verado outboard engines, to fire it to a staggering 70 knots (80.5 mph). However, the meticulous design means the RX700 isn't just about speed. 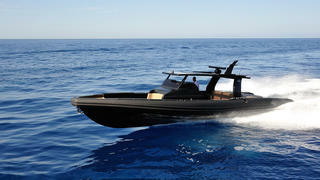 According to Wahoo it is also "perfectly behaved at sea in a sedate superyacht tender environment". The large 700 litre fuel tank means the RX700 is not just a one-trip wonder either. With a range of over 300 nautical miles it can easily venture ahead to the next destination along the coast, without having to wait for the mothership. The technically advanced 9.6 metre LX600 has a hull that was inspired by the race boat designs of legendary naval architect Lorne Campbell, but reconfigured by Wahoo's own designer for improved performance. Twin 300 horsepower Mercury Verado outboard engines power the LX600 to an impressive 65 knots (75 mph). It is the only rib of its kind to have Mercury's innovative joystick control system, making for super easy handling. The LX600 has space for 12 guests to fly across the waves in superyacht style. The custom JL Audio Marine speaker system can blast a superyacht worthy 1300 Watts through 12 speakers, three sub woofers and two amplifiers. The LX600 was delivered in November 2015 to join its 85.5 metre Oceanco mothership, Sunrays. The technically advanced 9.6 metre LX600 has a hull that was inspired by the race boat designs of legendary naval architect Lorne Campbell, but reconfigured by Wahoo's own designer for improved performance. Twin 300 horsepower Mercury Verado outboard engines power the LX600 to an impressive 65 knots (75 mph). It is the only rib of its kind to have Mercury's innovative joystick control system, making for super easy handling. The LX600 has space for 12 guests to fly across the waves in superyacht style. The custom JL Audio Marine speaker system can blast a superyacht worthy 1300 Watts through 12 speakers, three sub woofers and two amplifiers. The LX600 was delivered in November 2015 to join its 85.5 metre Oceanco mothership, Sunrays. 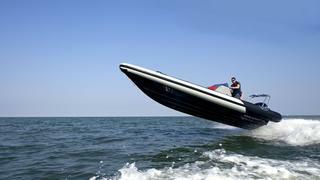 They might look more utilitarian, but few yacht tenders can beat the sporty handling and dry ride of a RIB. The X-line from X-Craft is one of the fastest yacht tenders around, running at top speeds exceeding 55 knots (63 mph) and capable of catching some air along the way. The deck configuration is customisable from eight to nine metres, meaning up to 11 customers can be carried in comfort. 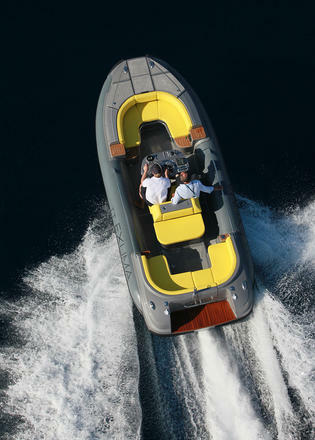 They might look more utilitarian, but few yacht tenders can beat the sporty handling and dry ride of a RIB. The X-line from X-Craft is one of the fastest yacht tenders around, running at top speeds exceeding 55 knots (63 mph) and capable of catching some air along the way. The deck configuration is customisable from eight to nine metres, meaning up to 11 customers can be carried in comfort. Italian yard Novamarine is no stranger to building high-performance custom powerboats, with 40 models sold to the Qatari Coast Guard alone, but the Black Shiver 140 is the pick of the bunch when it comes to speedy superyacht tenders. Motoring along at 48 knots even in choppy conditions, this aggressively styled tender cuts through the wave and boasts sporty handling without ever losing grip. Available in both cabin and open guises, the 13.85 metre Black Shiver 140 can be fitted out with a small galley, heads compartment and shower. 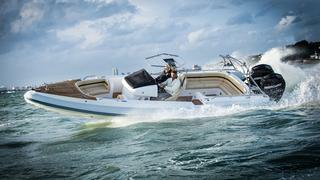 Engine options include inboard, outboard and jet-drive set-ups for a maximum output of 1,050hp. And with a triple 400hp Mercury outboard version on the way, this design looks set to rise even closer to the top of our list in 2017. Italian yard Novamarine is no stranger to building high-performance custom powerboats, with 40 models sold to the Qatari Coast Guard alone, but the Black Shiver 140 is the pick of the bunch when it comes to speedy superyacht tenders. Motoring along at 48 knots even in choppy conditions, this aggressively styled tender cuts through the wave and boasts sporty handling without ever losing grip. Available in both cabin and open guises, the 13.85 metre Black Shiver 140 can be fitted out with a small galley, heads compartment and shower. 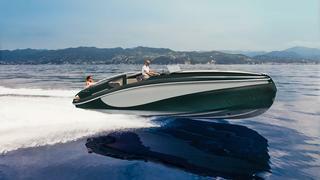 Engine options include inboard, outboard and jet-drive set-ups for a maximum output of 1,050hp. And with a triple 400hp Mercury outboard version on the way, this design looks set to rise even closer to the top of our list in 2017. As well as being one of the world’s fastest superyacht tenders, the Goldfish 23 eFusion is part of a fast-growing trend for electric tenders. Powered by a 194hp UQM electric motor, this 5.5 metre Scandinavian speedster boasts a twin stepped hull that can achieve a hair-raising 47 knots. As well as being one of the world’s fastest superyacht tenders, the Goldfish 23 eFusion is part of a fast-growing trend for electric tenders. Powered by a 194hp UQM electric motor, this 5.5 metre Scandinavian speedster boasts a twin stepped hull that can achieve a hair-raising 47 knots. Don't let the petite dimensions of this RIB fool you, though the Williams Turbojet 445 S is only 4.54 metres LOA, she packs a serious punch. 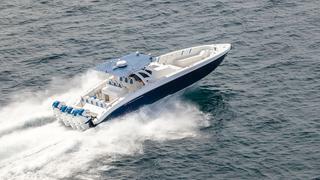 This fast tender can get up to a maximum speed of 46 knots (53 mph), leaving much larger yacht tenders in her wake. Not just for running ship to shore, the Turbojet 445 S can also tow water-skiers, making her an ideal all-around tender for yachts with limited garage stowage space. Don't let the petite dimensions of this RIB fool you, though the Williams Turbojet 445 S is only 4.54 metres LOA, she packs a serious punch. This fast tender can get up to a maximum speed of 46 knots (53 mph), leaving much larger yacht tenders in her wake. Not just for running ship to shore, the Turbojet 445 S can also tow water-skiers, making her an ideal all-around tender for yachts with limited garage stowage space. Italian jet drive specialist Castoldi knows a thing or two about speedy superyacht tenders, and the 6.24 metre Castoldi JT21 is the fastest in its collection, driven by a 260hp Yanmar engine to a top speed of more than 40 knots. The central helm position leaves room for up to 12 guests sitting forward and aft, while the jet drives are not only safer for watersports and swimming, but they also reduce the risk of running aground in shallow waters. For a fast yacht tender that is also undeniably beautiful, look no further than this limo tender by Hodgdon Yachts. The award-winning limo tender to Feadship yacht Sea Owl has been customised to match the yacht and is as detailed as her highly bespoke mothership. One of the top superyacht limo tenders, she offers comfortable indoor seating for trips to shore, getting there quickly thanks to a top speed of 40 knots (46 mph). For a fast yacht tender that is also undeniably beautiful, look no further than this limo tender by Hodgdon Yachts. The award-winning limo tender to Feadship yacht Sea Owl has been customised to match the yacht and is as detailed as her highly bespoke mothership. One of the top superyacht limo tenders, she offers comfortable indoor seating for trips to shore, getting there quickly thanks to a top speed of 40 knots (46 mph). Not only does Iguana Yachts' Iguana 29 Exclusive comfortably reach a top speed of 40 knots (46 mph), but it can do something that few fast superyacht tenders can. The luxury-packed Iguana 29 Exclusive amphibious superyacht tender goes from ocean running to driving right up on land, thanks to a rugged set of "arms" that drop down from her hull sides. A fast yacht tender that is also primed for onshore exploration? Yes, please! Not only does Iguana Yachts' Iguana 29 Exclusive comfortably reach a top speed of 40 knots (46 mph), but it can do something that few fast superyacht tenders can. The luxury-packed Iguana 29 Exclusive amphibious superyacht tender goes from ocean running to driving right up on land, thanks to a rugged set of "arms" that drop down from her hull sides. A fast yacht tender that is also primed for onshore exploration? Yes, please! This 9.3 metre tender is an all-Dutch affair — designed in collaboration with naval architects Vripack and built in Almere by XTenders. Used as a tender for a 83.5 metre Feadship superyacht, this sleek design packs a punch, with an impressive 39 knot top speed out on the open water. Key features including a rising coachroof and bimini that can covert the XTender 9.3 from a flat-out speed machine into an elegant limousine for carrying guests ashore. This 9.3 metre tender is an all-Dutch affair — designed in collaboration with naval architects Vripack and built in Almere by XTenders. Used as a tender for a 83.5 metre Feadship superyacht, this sleek design packs a punch, with an impressive 39 knot top speed out on the open water. Key features including a rising coachroof and bimini that can covert the XTender 9.3 from a flat-out speed machine into an elegant limousine for carrying guests ashore. The 9.25 metre Invictus 280GT superyacht tender is fast, and with lines by designer Christian Grande she is also super stylish. Her x-bow cuts beautiful shapes across the water as she rides at speeds up to 38 knots (44 mph), propelled by a 320hp Volvo V8 sterndrive diesel engine. Grande aimed to pack big amenities into the small package, so despite coming in under 10 metres, she still offers ample sunpads, a galley with fridge and a V-berth and toilet in the cabin. The 9.25 metre Invictus 280GT superyacht tender is fast, and with lines by designer Christian Grande she is also super stylish. Her x-bow cuts beautiful shapes across the water as she rides at speeds up to 38 knots (44 mph), propelled by a 320hp Volvo V8 sterndrive diesel engine. Grande aimed to pack big amenities into the small package, so despite coming in under 10 metres, she still offers ample sunpads, a galley with fridge and a V-berth and toilet in the cabin. The Wider 32 might have been designed to match the new Wider 165 flagship, but she is also an ideal standalone day boat. She has a surprisingly spacious cabin hidden inside with two sofas that are convertible to beds and a fully stocked galley. The Wider 32 can also be customised to match the yacht she services, seen on the water in a variety of colours already including orange, white and green. Best of all, this yacht tender is fast, hitting speeds of more than 37 knots (42.5 mph) when Boat International sea trialed the Wider 32 last year. 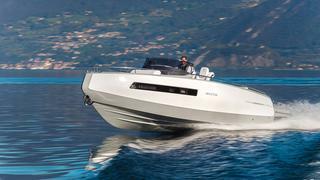 The Wider 32 might have been designed to match the new Wider 165 flagship, but she is also an ideal standalone day boat. She has a surprisingly spacious cabin hidden inside with two sofas that are convertible to beds and a fully stocked galley. The Wider 32 can also be customised to match the yacht she services, seen on the water in a variety of colours already including orange, white and green. 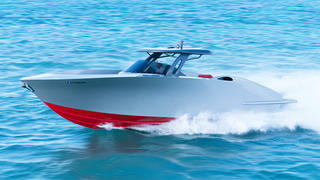 Best of all, this yacht tender is fast, hitting speeds of more than 37 knots (42.5 mph) when Boat International sea trialed the Wider 32 last year.